High School: Heritage High School. 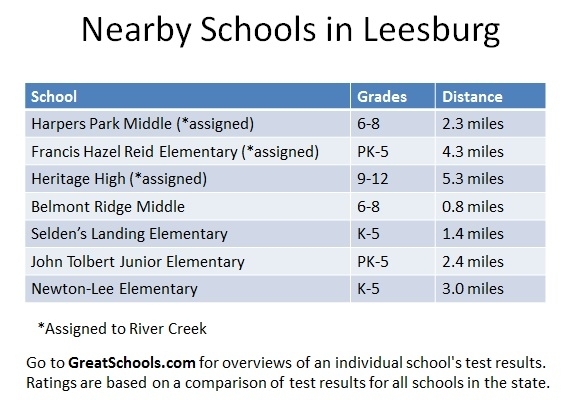 Private Schools: Leesburg is also served by several private schools, including Dominion Academy, a K–8 non-denominational Christian school; Leesburg Christian School, a K–12 non-denominational Christian school; and pre-K-8 Loudoun Country Day School. The area also offers numerous opportunities for higher and continuing education degrees and is home to regional university branches of George Washington University, James Madison University, and George Mason University. I am the stereotypical PTA mom. I wear a ponytail and my yoga pants (which have never, ever been to a yoga class) and drive around town in my mini-van while on my way to various meetings or volunteer opportunities. I’m not about to make a YouTube parody about my experience or star in a disturbing train wreck of a Bravo series, but overall I feel lucky to be able to spend time helping at my boys’ elementary school. I have a background in education as well, and I know how spoiled we are in Virginia to have such stellar school systems, especially compared to other parts of our country. While many children in the neighborhood attend private schools, our public elementary school is Frances Hazel Reid. One of the school’s many attributes is the commitment its teachers and administration have to making sure FHR is a community. Before school starts, for instance, the staff splits up into groups and spends a morning visiting students and their families. The students look forward to the day of the teacher visits and they wait in anticipation to see which teachers will show up at their doors. They have their photo taken with their teachers and spend a few minutes talking about their summer or conveying excitement about the coming year. How wonderful for the students to know that their teachers can’t wait for them to return. This year my middle-schooler ran downstairs too, just so he could say hello to his former teachers. Every student, from the straight-A student to the one who struggles, feels valued by his or her teachers. Frances Hazel Reid offers many community-building events. We no longer live in a time when a small geographical area feeds into the closest school. While we in RiverCreek feel a sense of community just by living in a neighborhood, we are fortunate to be part of a greater community that includes other neighborhoods as well. It’s fun to go to Bingo night and see friends who live outside of our “bubble” or to dine out one night and run into a classmate. FHR’s Science Explosion week showcases each class’s science experiment, in which the children take great pride, while bringing together local experts in the STEM (Science, Technology, Engineering, & Math) fields, parents and families, and students from the high schools. Parents help secure supplies and help document the experiences and everyone is brought together on Science Night to delight in the projects and enjoy a free night of science fun. And why spend an evening at the Kennedy Center when you can see fabulous theatre right here in Leesburg. Last year FHR offered two shows that students produced, designed, and performed by themselves under the guidance of parent volunteers. Students and parents supported a program earlier this year in which yards were flocked by FHR Ravens. Families could have each other’s front lawns, um, “decorated” with 25 black ravens, in a show of good fun and school spirit. During the winter months the school holds a Read-a-Thon, which last year raised money to purchase iPads for student classroom use. Students read – a perfect activity for those cold, dark, snowy months – and sponsors make donations in support. As a parent, I’d much rather support a program that encourages reading than to purchase fundraising items where only a percentage of the profit actually goes back to the school. The teachers appreciate being surveyed about what they would like for their students and then having that need met. Our children’s education is a community effort, and only part of their education happens in the classroom. They’re learning from the moment they wake until the moment they finally fall asleep. We are lucky to attend a school where the teachers, administrators, parents, families, and other community members collaborate to raise our little village. For those of you familiar with Heritage High School and their football program,you know that this season is quickly becoming something very special. For those of you not familiar with the program, the Heritage High School Varsity football team is 5-0 for the first time in school history and is showing no signs of slowing their roll. Nine of our very own River Creek boys suit up every week and run onto the field as part of the Varsity squad. The Heritage Varsity football program has struggled on and off for years, but once Tuscarora High School opened up and school boundaries were rezoned, the number of potential kids feeding into the high school that were interested in footballdrastically diminished. At about that same time, Heritage hired a new head football coach, Reed Prosser, to rebuild and strengthen the program. Coach Prosser was raised in Winchester, Virginia and played football, basketball and baseball at Handley High School. He attended the College of William & Mary, graduating in 1996, and was a three year letterman and two year offensive line starter on the football team. Since graduating, Coach Prosser has coached at Handley HS, built the ShenandoahUniversity football program (whose defense was nationally ranked), and coached at Broadway HS and Millbrook HS (both of which went to the playoffs several times). In addition to running the football program, Coach Prosser teaches freshman English atHeritageHigh School. The Varsity football team has not been to the playoffs since 2009. Atthis writing, Heritage High School is in the VHSL Dulles District and they are currently one of two undefeated AAAA teams (John Champe HS being the other team with no losses to date). If Heritage continues their undefeated season, they will host their first ever home playoff game in November. The excitement and the support for the Heritage Varsity team has been overwhelming this season as the stands are jam packed for each and every game. The student section, called the “Chaos Crew” has been at capacity and overflowing and the parents fill in on either side. My son, William Walker, has played tackle football since the age of six (and I now have an eight year old daughter playing tackle football for CLYFL), and I could not dream of a better high school football experience for him. Even if you don’t have a student playing on the team, or even a student at Heritage, a high school football game on a crisp, fall Friday evening is the perfect ending to a long week and is sure to bring back your own high school memories of Friday Night Lights. Please check with school office at 571-252-2800 for specific performance times. There are many things that are no longer allowed in public schools,and these policies have great intentions. But at Francis Hazel Reid School, even if for political correctness’ sake it is never stated out-loud, every student in Mrs. Ceppi’s class hears her heart saying, “You’re special and I love you!” daily. Dana Ceppi is in a single word, extraordinary. Her lessons have the perfect balance of information, humor, and appeal. We were blessed to have our daughter and our son in Mrs. Ceppi’s classroom during their individual 5th grade years, during which they positively excelled academically and in so many other ways. Make nomistake; Mrs. Ceppi is not a pushover. Her students work hard as she has high expectations for each one of them. But she finds every single student right where they are, and makes them eager to impress her with their progress. My daughter wrote a heartfelt thank you letter at the end of her time in Mrs. Ceppi’s class a few years ago, and it is prominently displayed in that classroom even now. If you ask Mrs. Ceppi about it, she can barely describe the letter without tearing up in the most genuine way. It’s just her nature. She invests, and it’s evident that each child matters. My son is adamantly against any public displays of affection; as boys his age typically can be. But at the conclusion of his 5th grade promotion ceremony, one of our fondest mementos is a snapshot of Mrs. Ceppi giving our son’s cheek an affectionate kiss while he smiled from ear-to-ear. In addition to her phenomenal personality, Mrs.Ceppi has to be the most avid reader in all of Loudoun Public Schools—and quite possibly beyond. Her influence inspired both of my children to read for hours on a daily basis. Where we once spent weekends buying toys, gadgets, and electronic games; we now spend many weekends buying book series, which my kids start reading immediately on the car ride home. They simply can’t wait to dive-in. My son and daughter are both in middle school now, and they had been pleading to pop by FHR to say hello to Mrs. Ceppi. It’s incredibly difficult to change our morning routine, but it was worth every bit of juggling that we had to do in order to hug this incredible lady for a few brief minutes before racing off to meet the demands of the day. Some teachers are trained; and some are called. Mrs. Ceppi is the former and the latter fused together with nothing but love.